Is Christian belief rationally acceptable? Must every Christian defend his or her beliefs with exhaustively logical arguments, or is belief solely a matter of faith rather than logical argument? In Communities of Informed Judgment, Frederick D. Aquino offers an alternative route, showing how John Henry Newman's notion of the illative sense of reasoning paves a way for constructing a fresh account of the rationality of Christian belief. Moving beyond both modern and postmodern accounts of rationality, Aquino constructs a proposal of informed judgment, blending Newman's notion of the illative sense of reasoning with recent work in social and virtue epistemology. The first part of the book focuses primarily on Newman's treatment of the illative sense in the Grammar of Assent, with the University Sermons as a backdrop. The second part addresses the problem of securing a common standard of justification. Though Newman acknowledges the social and communal facets of judgment, his focus is primarily on the personal dimension. 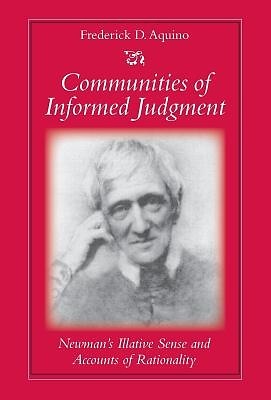 Aquino develops Newman's insights into a social epistemology of informed judgment, transposing the problem of common measure into a problem of trusting the illative sense as a reliable belief-forming process in communities of informed judgment. An original contribution to Newman studies, the book has an interdisciplinary focus, drawing from recent work in social epistemology, virtue epistemology, and cognitive science. It also takes up issues relevant to the philosophy of religion, epistemology of religious belief, systematic theology, ecumenical dialogue, and studies in John Henry Newman. Frederick D. Aquino is Assistant Professor of Theology at AbileneChristian University. He serves on the editorial boards of Newman Studies Journal and Christian Higher Education, and is the editor of Journal for Case Teaching.